Humans aren’t eligible for third party liability coverage in the faery health insurance plan. There won’t be a page next week, I need to take a little mental/physical health break. But I’ve tried an alternative barmbrack recipe that is a quickbread instead of a yeast bread (read: less time and effort to make), so I’ll share that with you next week, and then we’ll get back to regular updates. Well she’s learning- she’s asking smarter questions. This gets better and better. Tread carefully Ina! Take care of yourself, and see you soon! Oh and the expressions on Ina’s face are priceless! Walk away from the tricksy, imprisoned evil tree-woman witch, Ina. Walk away… Riverdance if you gotta. Take care of yourself as well, Chelsea. We’ll wait. 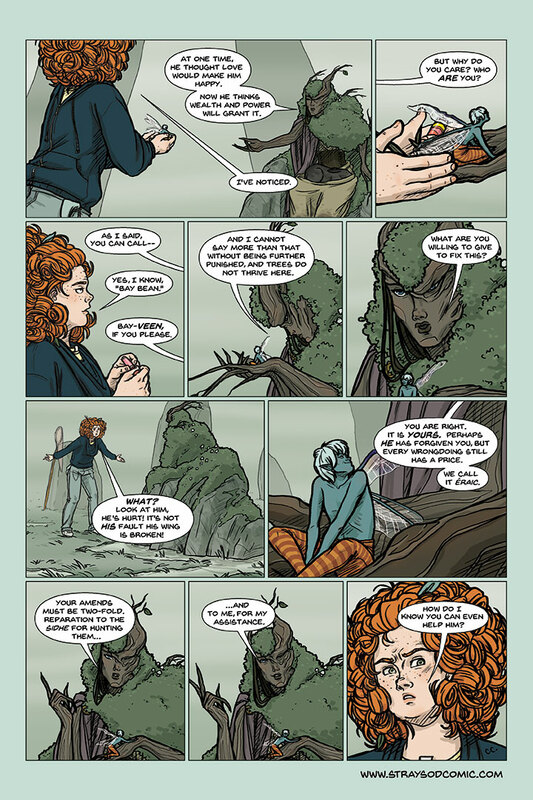 Given what she says in panel 4, it’s possible that her crime was blabbing faerie secrets? If the Wood Lady tells the truth then Love Talker seemed to be in love with somebody before the story began…and it did not end well. Or he simply thought that he was in love…who knows. I just re-read your story tonight. Hope you’re well because it’s really a wonderful work you’ve began! All this details on the fae and little people, the characters, the drawing…really good good goooood job! Won’t you try to publish it? I personaly work on a semi-graphic trilogy with some of this creatures- that’s how I found your great comic-looking for some similar work after I knew the trilogy will be published. It’s funny and interesting to see your truly nice vision of them. Really hope you’ll soon get well. If you can and want to, I’d like to talk to you about these creatures. Even if it isn’t possible, I wish you all the best and wait for the end of the story. Hope everything ‘s well now for you. I love meeting people who are working in the folklore genre. You are welcome to email me about folklore anytime, or we can also discuss creatures here. 🙂 I have been looking at your site, and it looks like you’ve been working hard on a lot of projects! I’m glad you’ve been enjoying the comic. The self-published comics are available in the online store for readers who want physical copies.